Aomei has kindly offered five (5) licenses to our DCT readers for a Partition Assistant Pro 6.6 giveaway contest. These licenses are currently valued at $39.95(US) each, but you can get a chance to win one for free simply by entering this contest. Aomei PA Pro installs with no hitches or giddy-ups. You don’t have to keep an eye out for any bloatware or other unwanted downloads or installations. Perfect! Aomei PA Pro will recognize any file system that Windows recognizes. For a full list of features, please see this Features Page. DCT has run giveaway contests for Aomei PA Pro in the past. If you would like to see a change log for this latest (and previous) version, please visit this Change Log Page. Backups — If you keep all your files neatly organized in devoted folders (ie, movies, pictures, games, etc. ), then everything is on a single disk. This will make for huge backups that will take a long time to run. 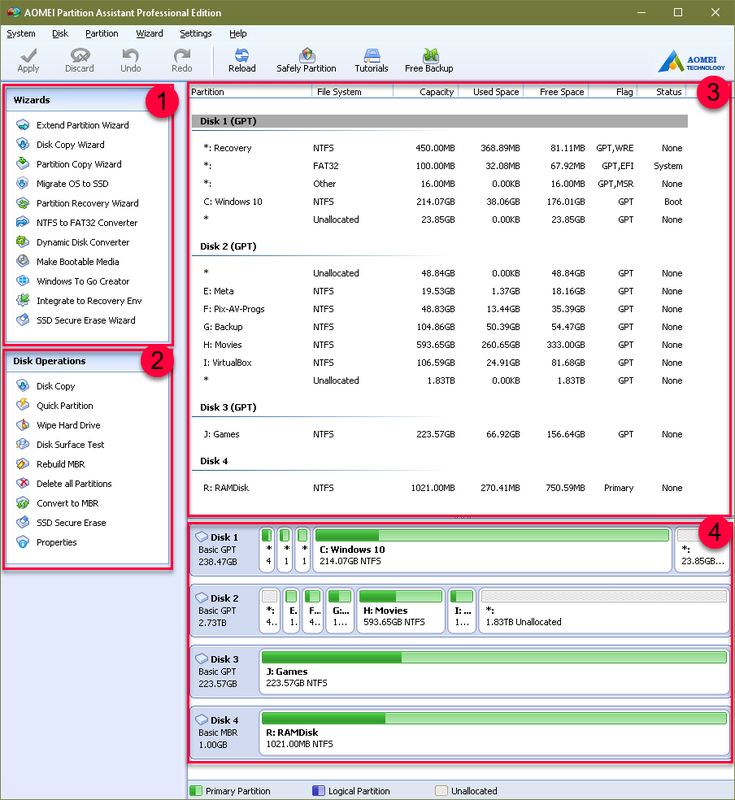 By creating partitions, you can split those backups into smaller chunks that will process much faster. This should also make the backup drudgery less painful for those of you who may see it that way. Incidentally, if your backup regimen is painful, or takes a long time, then you’re doing it wrong. Separation of Data — By keeping your data separate from your operating system and program files, it is much less likely that you will lose said data in the event of a disk malfunction. Should the day ever come when you will be forced into re-installing Windows, you won’t have to mess with your data files. They will be safely stored in another partition (ideally on another drive). The installation will go much more smoothly and more quickly, too. Speed — Hard drives are huge these days. When a multi-terabyte drive starts filling up things can noticeably slow down. 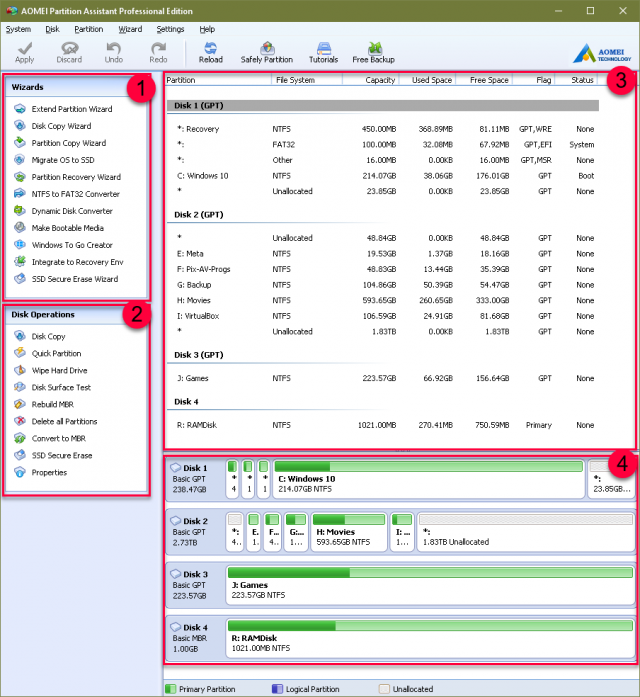 By using partitions, you are essentially creating smaller, more manageable drives. Smaller usually means faster where hard drives are concerned. There are countless reasons to partition your drives into manageable chunks and I’ve only pointed out four of them. Some may say I go a tad overboard in this regard, but, knock on wood, I haven’t lost any data, yet. I take that back– I did once long ago and that was before I started using partitions. Aomei Partition Assistant Pro is a top-notch piece of software. It works right out of the box and does exactly what it says it will do. As an added benefit, this program is completely portable. You can copy its installation directory to a USB drive and carry it in your pocket. I love this program. We’d appreciate it if you’d take a moment and submit a comment telling us why you’d like to win Aomei Partition Assistant Pro. However, submitting a comment is not required to enter this contest and will have no bearing on your chances. Next:Are You A Gadget Freak? I just upgraded my Windows XP to Aomei Standard Edition v6.6. So it will indeed run on XP. That’s fantastic that you can copy the install directory as a portable program. Thanks for the chance to win some nice software. Guys I have always been restricted to Mini Tool and recently was exposed to your program and what a difference. Bonjour Mr Pedersen et à vous tous !!!! Merci à vous et bonne chance à tous !!!!!! Thank you daves amazing tool for partitioning hdd-ssd.